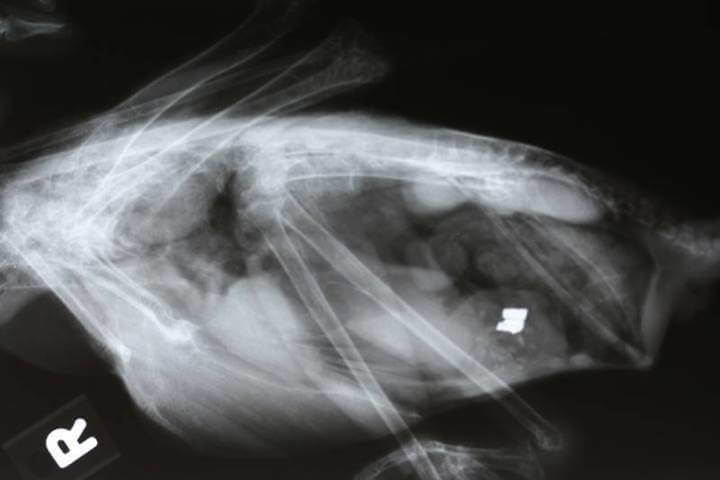 Poisoning from the intake of lead, zinc and occasionally copper is called “heavy metal” poisoning in birds and is one of the most common avian toxicities that we see at our Melbourne Bird Hospital in pet and aviary birds. Birds are often inquisitive and examine new objects and place then in their mouths. They like to chew on shiny objects. Toxicity n birds can result if the metallic object contains heavy metals. Stainless steel is safe for birds and an ideal product for feed dishes and cages. 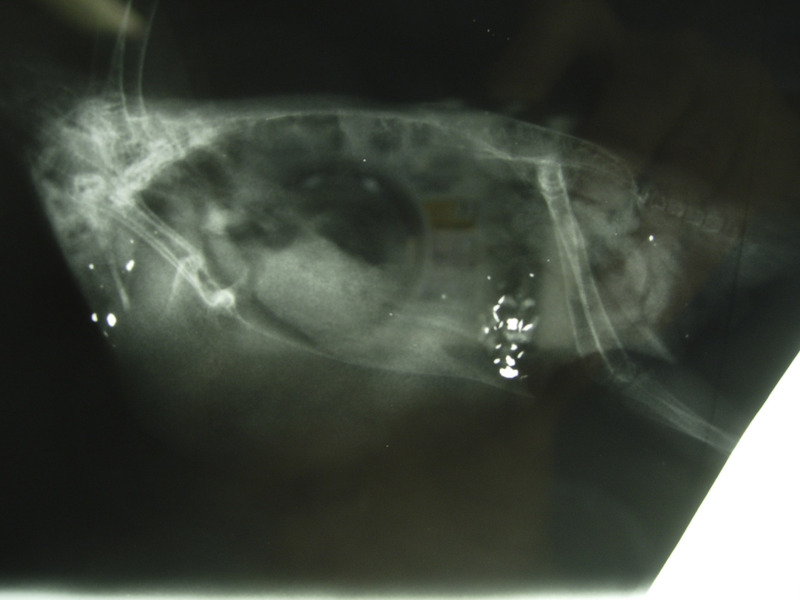 HMT in birds is largely a preventable disease and we will discuss how typical cases present to our Melbourne veterinary clinic and what steps owners can take to prevent heavy metal toxicity. The clinical signs in birds are related to effects on the nervous system, bloods cells, kidneys and intestines. 1) Discuss the bird’s environment with the owner – especially concerning cage material, toys, and cage enclosure age - exposure of bird to toxins and a discussion of the birds’ environment. 2) On physical examination we may find – regurgitation or vomiting, watery green or bloody droppings, weakness, and fitting. 4) Changes in blood enzyme levels to reflect damage to organs and red blood cells. 1) Fluid therapy to protect the organs from further damage and to flush the toxins out the body. 2) A metal cheating agent, calcium EDTA – works by “trapping” the lead or zinc into its central ring and then filtering it out the kidneys, or into the intestine. The drug is injected twice daily till improvement starts. Oral D-penacillamine is can also be used as an oral medication. 3) Antibiotics are given to prevent infections while the body is recovering. 4) Crop feeding - to add fluids and calories necessary for recovery. 5) Vitamin B complex and especially thiamine to prevent deposition of metal into tissues and help the nerves recover. 6) Place avian patient in an incubator in a quiet low stress environment so all of the bird’s energy can be used for recovery. 7) Treatment of seizures with anticonvulsants. 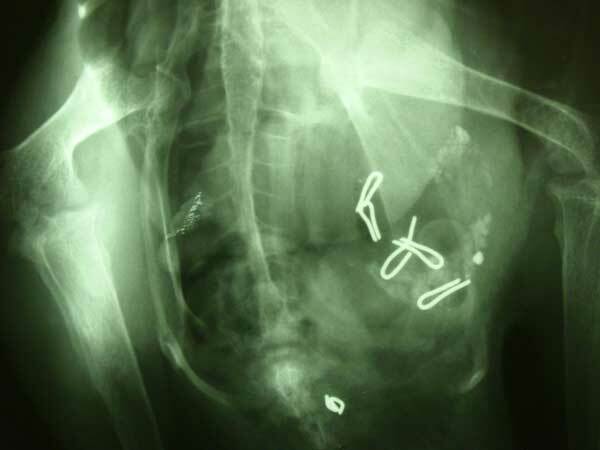 8) Large metal pieces may be removed under general aesthesia or if possible allowed to pass naturally. 9) Smaller metal pieces not passing through can be flushed under general anaesthetic using warm fluids. 10) Bulking agents can be added to the diet or crop fed to hasten the removal of metal particles through the gastrointestinal system. 1) Avoid sources of lead and zinc and copper. 2) Stainless steel cages and toys and food containers are safe. 4) Read through the tables in the article and familiarize yourself with some of the many potential sources of toxic metals. 5) Avoid your pet access to objects that are potentially life threatening. 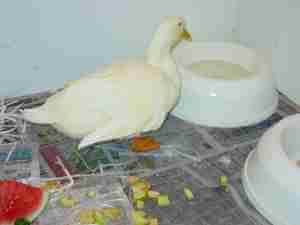 Harold an 8-year-old male Pekin Duck presented with water droppings containing fresh blood, a wing droop and tail deviated to the left. His owners absolutely adored him and were determined to get him better. We repeated the x-rays in 2 weeks and most of the metal densities had passed so surgery was not necessary, the blood in the droppings gradually cleared and Harold has made a good recovery.